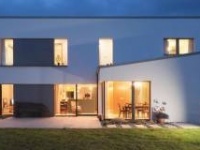 Eager to soak up as much information as possible on our passive journey, we couldn’t pass up the opportunity to avail of the nZEB Open Doors event on 12 November last year. 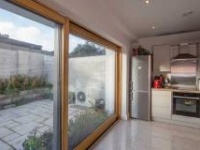 The most convenient location for us to visit was a three-unit passive house development in leafy south Dublin. It was a bright crisp day, about 10C outside, sunny with a few passing clouds. The development’s main contractor, Pat Doran Construction Ltd, was our host. Active discussions arose on all aspects of the build to date, including challenges associated with the decision to aim for the passive house standard after planning permission was granted, and the impact of that decision on different aspects of the project. The detached masonry build had beaten the 0.6 ACH passive house airtightness target during a blower door test a few days earlier. But with the plasterboard not yet installed, this was an ideal time to see the critical internal workings of the building, including airtightness membranes and MVHR ducting. It was also easier to see how cold bridges might occur at points where elements of the house come together, creating a path of least resistance for heat to trickle out of the structure. Despite the relatively clear day and large glazed elements, it was colder inside than out — not much evidence of the power of passive solar gain. But we learned that due to the less than optimal orientation in the design, to achieve the passive house standard the PHPP calculations dictated very high U-value specifications for the floor, walls, windows and roof, adding considerably to the cost. It is likely our own house will be timber frame, but nonetheless it was useful to understand the implications of choosing that over masonry. Visualising and chatting about the challenges associated with masonry construction, and the challenges associated with aiming for the passive house standard after the design was finalised, highlighted the importance of careful planning of critical details. For us the trip was well worth the effort, and we left with a much better appreciation of the value of meticulous planning for this type of project. With planning for our own house granted, we focused on other essential technical information when assembling a tender package. 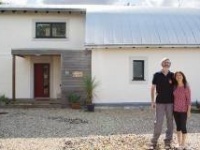 It is important to us that everybody we engage has a good appreciation for passive house principles and construction. I asked around and following recommendations we engaged with Tanner Structural Designs Ltd and Jot Energy Ltd. Both were very responsive to queries — not always a given in my experience. Activity in the industry must be on the up, as plenty of the queries we sent out went unanswered. Of particular interest was Tanner Structural Designs’ expertise in the design of insulated foundations and breathable timber frame construction. The company’s Hilliard Tanner was a mine of information about the options we needed to consider with regard to the civil works on the project. He also pointed out some issues with the design specifications in the roof that were quickly resolved. Completing construction drawings felt like a big step forward. Meanwhile Jeff O’Toole of Jot Energy has a background in construction, an MSc in Sustainable Energy Engineering, is a certified passive house consultant and a BER assessor. Jot Energy also provide airtightness testing and thermal imaging services, and having a single point of contact for all things associated with getting the performance of the house optimised was extremely attractive. Jeff drew our attention to the large sliding doors, giving us a lot to think about. In order to achieve the passive standard, the doors could potentially cost €20,000 each. 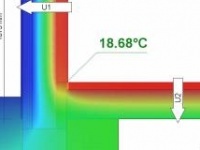 This is in part associated with balancing the less than optimal volume-to-floor area of the overall design, and the high spec required to manage airtightness. If this was brought to our attention during the design process, the feature would have been less appealing as there is no great panoramic view from the site. With a road map for the technical stuff almost complete, consideration for basic internal finishes is moving up our list of priorities. Joinery is the current hot topic for research. I’ve always loved walnut but recently met the voice of reason at a local supplier’s showroom, with my darling eight and five-year-old sons in tow. When I mentioned walnut, the supplier asked with a nod, ‘are there any more of those?’, and when he heard there was another two-year-old, he immediately said: ‘you don’t want walnut’. Then he proceeded to demonstrate just how easy it is to scratch. With three very active boys, I can easily imagine how walnut joinery will look after a few months of collisions. So it’s back to the drawing board in an attempt to rewire our long-term admiration of walnut, and the notion that it was going to be integral to the internal finish of our new house. It’s a home we’re building not a show house, and we all need to enjoy it rather than look after it so it can look pretty. These voices of reason have been invaluable throughout this project, as the learning curve has been very steep. Sometimes it feels like this project takes one step forward and two steps back. It seems that revising and reviewing as each new piece of information becomes available is all part of the balancing act of complying with the planning permission, building regulations, the passive house standard and our priorities and preferences for our family home.